Judd (1878) [Fig.8/1] proposed the first comprehensive lithostratigraphy for the Cretaceous of western Scotland in the third of his extensive papers on the Strata of the Western Coast and Islands. Whilst recognising that there was “very rapid and remarkable changes in thickness and character” he divided the widely spaced successions into four members (numbered I to IV down sequence) representing two marine and estuarine phases of sedimentation. The members in ascending order were Glauconitic Greensand (IV), White Sandstone or Lower Estuarine Series (III), Chalk with bands of flint or Upper Chalk (II) and Sandstones with white marls or Upper Estuarine Series (I). He considered member IV to be unequivocally of Cenomanian (or mistakenly equivalent to the Upper Greensand) age, member II contained Belemnitella mucronata and was equivalent to the greater part of the White Limestone of Ireland, thus placing his White Sandstone or ‘Lower Estuarine series’ (III) as the equivalent to the whole or part of the Chalk of England. He tentatively placed his Sandstones and white marls or ‘Upper Estuarine series’ (I) in the Cretaceous but suggested that it may well prove to be of younger ‘Tertiary’ age. 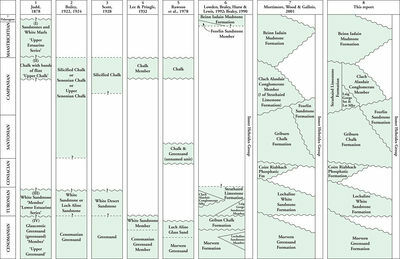 His terms of Upper and Lower Estuarine Series are completely different from the Jurassic strata of the same names. He also suggested thicknesses for his members based on the known exposures as follows: VI a maximum of 60 feet (18.3m), III an average of 100 feet (30.5m), II a minimum of 10 feet (3.1m) and I a minimum of 20 feet (6.1m) (Figure 8). Subsequent work by Survey officers and others up to the 1920s added to the number of known localities beyond those mentioned by Judd. Much of this work is to be found in the memoirs of the Survey (e.g. Bailey and Anderson, 1925; Lee and Bailey, 1925) and other papers (see Bailey, 1924; Scott, 1928) [Fig.8/2 and Fig.8/3] where a tripartite sequence was described similar to that of Judd but with the proviso that Judd’s highest unit (I) was essentially ignored or regarded as of ‘Tertiary’ age. This work was summarised briefly in Lee and Pringle (1932) [Fig.8/4] within a synopsis of all of the Mesozoic rocks of Scotland. A variety of slightly different terms were used (some with the informal epithet of member or with a locality descriptor). For example in those memoirs and papers the White Sandstone (III) became closely associated with the Loch Aline locality thus creating the term Loch Aline White Sandstone or Glass Sand (this latter term being used because of the rocks exceptional purity and its use in the optical industry). Humphries (1961) comprehensively described the White Sandstone of Loch Aline. Rawson et al (1978) [Fig.8/5] introduced the formal term of Morvern Greensand Formation, and so implied that the overlying Loch Aline Glass Sand was also of formational level. The beds above the Loch Aline Glass Sand Formation were unnamed units of ‘chalk and greensand’ and ‘chalk’. Braley (1990) described the Cretaceous rocks of northwest Scotland and developed the formal terminology, down to member level, outlined in Lowden, et al. (1992) and in Figure 5 [Fig.8/6], herein. She introduced the term Inner Hebrides Group to cover all of the Cretaceous beds, and the thin Paleocene(?) sediments, beneath the basalts in the region. However, there are serious problems with the dating of the various units within the sequence. Hancock (2000) introduced the term Gribun Conglomerate Formation to cover the highest beds, of Maastrichtian(?) age, in the Gribun section on the Isle of Mull. This should not be confused with the Gribun Chalk Formation (Lowden et al. 1992) which they determined to be of Turonian(?) age. 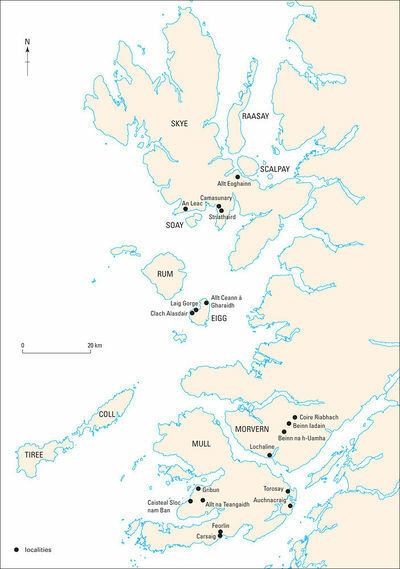 Emeleus (1997) utilised part of this scheme to describe the rocks encountered on Eigg, including the Laig Gorge Beds of Hudson (1960). Most recently the succession of Cretaceous rocks in the Inner Hebrides Group, at SSSI and other sites in the northwest of Scotland has been the subject of review as part of the Geological Conservation Review (GCR) Series funded by the Joint Nature Conservation Committee. The GCR volume, the British Upper Cretaceous Stratigraphy (Mortimore, et al., 2001), [Fig.8/7] gives a comprehensive account of the sequence, formalises the nomenclature, partly in accordance with Braley (1990) but makes significant changes to the chronology, and corrects earlier correlations. It goes further and suggests correlation with the sequences exposed in Northern Ireland. This document is considered as the standard for the Inner Hebrides Group (see Figure 8). These entries are formalised following the review of Upper Cretaceous nomenclature in Mortimore, Wood and Gallois (2001) that provides the most up-to-date and comprehensive study of these rocks following-on from the work of Braley (1990). The equivalent terms utilised in BGS products are also shown. With the limited and widely spaced outcrops it is inevitable that there is still some debate as to the exact correlation of each of the condensed successions known and indeed the prospect of further successions coming to light that will alter our understanding cannot be discounted. Whilst the Cenomanian age for the basal beds is firmly established, the sparse fauna and degree of reworking can only suggest that Turonian, Santonian and Campanian sedimentary rocks remain. Depositional environments can be difficult to establish and it is by no means certain that a single basin with related sediments can be demonstrated. This problem is of course compounded by the degree of diagenesis suffered by the succession beneath the thick Paleocene basalt cover. Table 4: The lithostratigraphical units utilised on the 1:50 000 Geological maps and within the descriptive memoirs of Scotland. This page was last modified on 11 June 2014, at 11:51.